LAS VEGAS, Jan. 18, 2018 (GLOBE NEWSWIRE) -- Live Ventures Incorporated (Nasdaq:LIVE), a diversified holding company, today announced financial results from its fiscal year ended September 30, 2017. 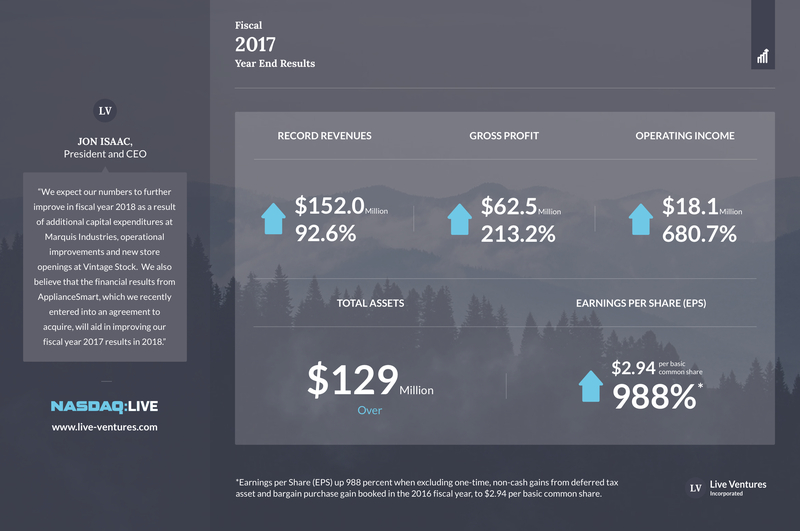 Reporting its most successful year in the company’s history, Live Ventures reported a record $152.0 million in revenues, an increase of 92.6 percent over the previous fiscal year. Stockholders’ equity, management’s preferred measurement for performance, increased by 39 percent year-over-year. Since present management took over six years ago, stockholders’ equity has grown at a rate of 88.6 percent compounded annually. Live Ventures Incorporated, originally incorporated in 1968, is a diversified holding company with several wholly owned subsidiaries and a strategic focus on acquiring profitable companies that have demonstrated a strong history of earnings power. Through its subsidiary, Marquis Industries, the company operates as a specialty, high-performance yarns manufacturer and hard-surfaces re-seller. Marquis Industries, which is a top-10 high-end residential carpet manufacturer in the United States, utilizes its state-of-the-art yarn extrusion capacity to market monofilament textured yarn products to the artificial turf industry. Marquis is the only manufacturer in the world that can produce certain types of yarn prized by the industry. Through its subsidiary Vintage Stock, Inc., an award-winning entertainment retailer, the company sells new and preowned movies, classic and current generation video games and systems, music on cd & lp, collectible comics, books, toys, and more. Vintage Stock, through its stores and website, ships product worldwide directly to the customer’s doorstep. This press release may contain "forward-looking statements" within the meaning of the Private Securities Litigation Reform Act of 1995. In accordance with the safe harbor provisions of this Act, statements contained herein that look forward in time that include everything other than historical information, involve risks and uncertainties that may affect the company’s actual results. These forward-looking statements can be identified by terminology such as "will," "expects," "anticipates," "future," "intends," "plans," "believes," "estimates" and similar statements. Live Ventures may also make written or oral forward-looking statements in its periodic reports to the U.S. Securities and Exchange Commission on Forms 10-K, 10-Q and 8-K, in its annual report to stockholders, in press releases and other written materials and in oral statements made by its officers, directors or employees to third parties. There can be no assurance that such statements will prove to be accurate and there are a number of important factors that could cause actual results to differ materially from those expressed in any forward-looking statements made by the company, including, but not limited to, plans and objectives of management for future operations or products, the market acceptance or future success of our products, and our future financial performance. The company cautions that these forward-looking statements are further qualified by other factors including, but not limited to, those set forth in the company’s Form 10-K for the fiscal year ended September 30, 2017 (available at http://www.sec.gov). Live Ventures undertakes no obligation to publicly update or revise any statements in this release, whether as a result of new information, future events, or otherwise. *As of the date of this press release, the total number of basic common shares outstanding is 1,991,879. © 2019 LIVE VENTURES INCORPORATED. All Rights Reserved.